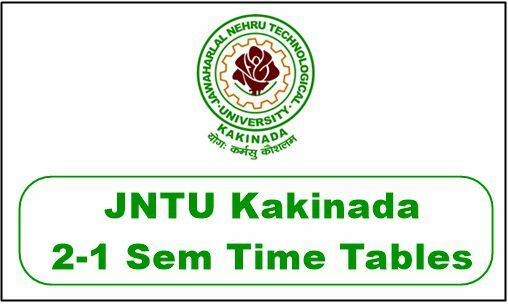 JNTUK 2-1 Time table 2018: JNTU Kakinada B.Tech 2-1 Sem Regular/Supply Time tables October/November 2018 for R16, R13, R10 Regulations are announced. Download jntuk II year I sem end examination time tables 2018 below. Jawaharlal Nehru Technological University, Kakinada (JNTUK) has announced the B.Tech/B.Pharmacy II year I Semester R16, R13, R10 Regular/Supplementary Examination Time Tables Oct/Nov 2018 on it’s official site. The Candidates who are looking for the 2-1 sem time table, All those candidates are requested to download the 2-1 sem Time Table 2018 from below. After that, the students are advised to start preparing for the semester examinations. The JNTUK Time tables contains branch wise (Civil, ECE, CSE, Mechanical, EEE, IT, AE, PE) examination dates and time. You can also get the regular and supplementary examination Jumbling Centres from here. As per the schedule, the examination will be held from Friday, 26th October 2018. R16 Regulation: For theory subjects the distribution shall be 30 marks for Internal Evaluation and 70 marks for the End – Examinations. The end semester examination is conducted covering the topics of all Units for 70 marks. End Exam Paper: Part-A 1st Question is mandatory covering all the syllabus which contains seven 2 marks questions for 14 marks with atleast 2 marks of question for each of the six units and in Part-B 4 Questions out of 6 Questions are to be answered with each carrying 14 marks . Part-A & Part-B put together gives for 70 marks. R13 Regulation: The end semester examination is conducted covering the topics of all Units for 70 marks. Part – A contains a mandatory question (Brainstorming / Thought provoking / case study) for 22 marks. Part – B has 6 questions (One from each Unit). The student has to answer 3 out of 6 questions in Part – B and carries a weightage of 16 marks each. R10 Regulation: The end semester examination is conducted covering the topics of all Units for 75 marks. Part – A contains a mandatory question (Brainstorming / Thought provoking / case study) for 75 marks. The student has to answer 5 out of 8 questions in Part – A and carries a weightage of 15 marks each. iii. The principals are requested to inform the university any other substitute subjects that are not included in the above list immediately. The candidates who are searching for JNTUK 2-1 sem Time Table 2018 you will need to visit the Official website: jntuk.edu.in or click on the above links. Sir ,Will you please declare the dates of jntuk lab external dates please???? When was the 3-2 supply ? Sir give me any reply …. They are not official, they are just updating you the info.. thats all.. once again take a note JFU is not any official..